These new hard hat suspensions maximise wearing comfort and ensure quick one-hand use with innovative systems. The Push-Key suspension is the first economic sliding adjustment with one-touch solution: simple push to loosen, squeeze to tighten. It offers greater retention capacity than any other sliding suspension because it is so much easier to select the best adjustment position with one hand even when worn. Two different sweatband options are available depending on application or preference: sewn-in PVC-perforated wipeable or sweat-wicking replaceable foam. Extensive customer research showed the Fas-Trac® III wheel ratchet suspension was preferred by most users over what they were currently wearing because it improved helmet comfort, retention and stability whilst being easy to adjust with one hand only. This premium suspension comes with a lower nape strap than any other protective helmet suspension to improve balance and retention: helmets stay on when leaning over. The comfort pad by separating the ratchet from the neck, cradles the head increasing comfort and cooling airflow. The Fas-Trac® III suspension also features a ratchet with smooth rotation and an easy-grip knob adjustable even with gloves on. With lengths and three levels of height adjustment, it gives superior nape fit and offers compatibility with other PPE. Fas-Trac ®III has the largest sweatband surface area on the market, which covers more of the headband and user’s forehead for better sweat absorption. Two different sweatband options are available depending on application or preference: sewn-in PVC perforated wipeable or sweat-wicking replaceable foam, which is machine washable. The foam sweatband is made with breathable fabric, which allows direct air permeation. Designed to provide greater comfort to the wearer, the Fas-Trac® III is the cure for helmet wearer headaches. Push-Key and Fas-Trac® III are now available for all 7 V-Gard helmet models. The V-Gard head protection system prevents electrostatic charge, making them suitable for use in ATEX environments. In the mining industry the helmets with accessories can be used for any type of extraction and at any depth. The wide range of options and accessories available extend the value for miners: two types of front lamp bracket and rear cable loop, stowable visor, closely-fitting goggles, full face visors, helmet-mounted hearing protectors. All of them can be used in conjunction with MSA’s disposable half-masks and half-masks with a bayonet-style design. For further information please visit http://de.msasafety.com/Fas-Trac?locale=EN. 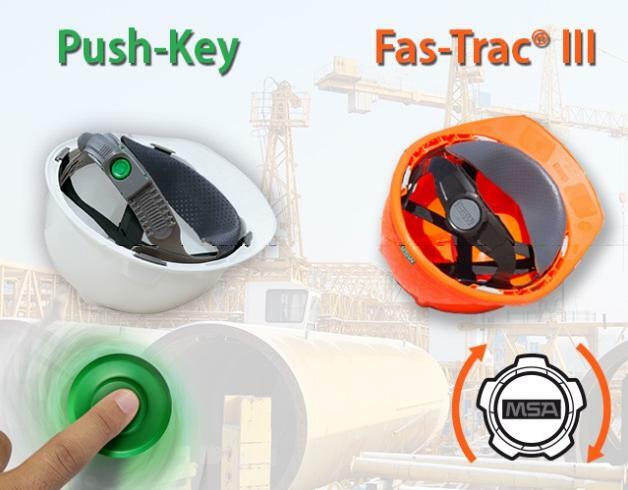 Image: MSA’s new Push-Key and Fas-Trac® III helmet suspensions. Photo: courtesy of MSA.